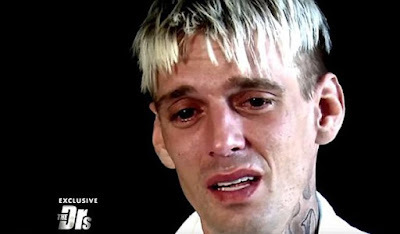 Aaron Carter has revealed he fears that he is HIV-positive. The troubled US pop star has given an emotional, tell-all two-part TV interview where he discusses his health battles. Following on from a tearful interview where he opens up about his addictions to cosmetic surgery and painkillers, as well as addressing rumours he's been using crack cocaine and meth, Nick Carter's younger brother has admitted he has another huge concern. The 29-year-old, who is 6ft tall, weighs just 115lbs which is underweight for an adult male. And his worries over his weight has led him to wonder if he is HIV-positive. "I need help, I'm scared," he tells the hosts of The Doctors in a clip from Thursday's show obtained by DailyMail.com. He adds: "Because I'm so skinny, I'm still so skinny. And that was the biggest one for me." On Thursday's show, the singer will be tested for HIV and given the results. In Wednesday's show, Aaron tells host Travis Lane Stork that he's worried about dying too soon. "My greatest fear is not being able to live as long as I can. That's my greatest fear." Earlier this year Aaron lost his father Bob, and his sister Leslie Carter died in 2012. Later in show he breaks down in tears as he says he's lost his family - including estranged brother Nick Carter.